This Religious Coin Token - St Christopher with Prayer can only be purchased in these bulk lots of 25 units at a discounted wholesale price, which is now available to the public. These discounted bulk packs offer the perfect solution if you want to give these Catholic goods away as gifts or to use as free envangelizing tools. Imported from Italy. This Religious Coin Token - St Florian with Prayer can only be purchased in these bulk lots of 25 units at a discounted wholesale price, which is now available to the public. These discounted bulk packs offer the perfect solution if you want to give these Catholic goods away as gifts or to use as free envangelizing tools. Imported from Italy. 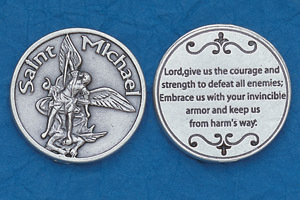 This Religious Coin Token - Saint Michael Prayer can only be purchased in these bulk lots of 25 units at a discounted wholesale price, which is now available to the public. These discounted bulk packs offer the perfect solution if you want to give these Catholic goods away as gifts or to use as free envangelizing tools. Imported from Italy. This Religious Coin Token - St Benedict Medal - Image on Front is the Medal of St Benedict and image on back is the image of St Benedict with insignia can only be purchased in these bulk lots of 25 units at a discounted wholesale price, which is now available to the public. These discounted bulk packs offer the perfect solution if you want to give these Catholic goods away as gifts or to use as free envangelizing tools. Imported from Italy. Our St Christopher/Our Lady Of Highway 3-Pack features 3 units for one low price. 1.5" Saint Christopher/Our Lady of the Highway Key Ring, Imported from Italy. This 25-Pack - Religious Coin Token - St Michael for Servicemen has passed our quality control assessment and meets our strict criteria to be a Catholic Shop product. Buy with confidence. Catholic Shop aims to carry the finest products on the market. Our staff has inspected and tested this 25-Pack - Religious Coin Token - St Michael for Servicemen and found it to be worthy of our Satisfaction Guarantee.